Bedrooms: 24 "(12) Two Bedroom Units"
Year Built: 1980 "Approx. " Beautiful 12 Two Bdrm building, great for retirement Home or rental building! Major renovation in 2017 & 2018 (Built-in 1980)! The building was stripped to the studs, plywood floors,Modifications done to each unit:New electrical panels & electrical circuits brought to code, C/Air units added, new Plumbing shutoffs & hot water tank pan installed & fixture updates,new Vapor barrier, fire & soundproofing insulation, 5/8" fire rated drywall, Porcelain tiles, hardwood & engineered hardwood flooring, Kitchen cabinets, quartz countertops, tile backsplash, new appliances, Bathtub, tile surround, bath vanity & sink. Outdoors, all windows & doors have been replaced as has the siding & the roof shingles. Individualized storage units with a tin roof have been added on a concrete floor. The storage will be sided w/cement board in the spring at which time the mansard will be refurbished. An interactive entry system shall be installed. 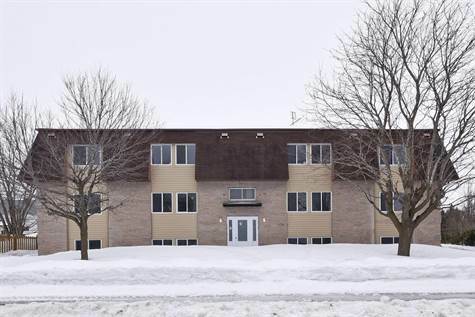 Close to Nation River, No Frills, church & all amenities.